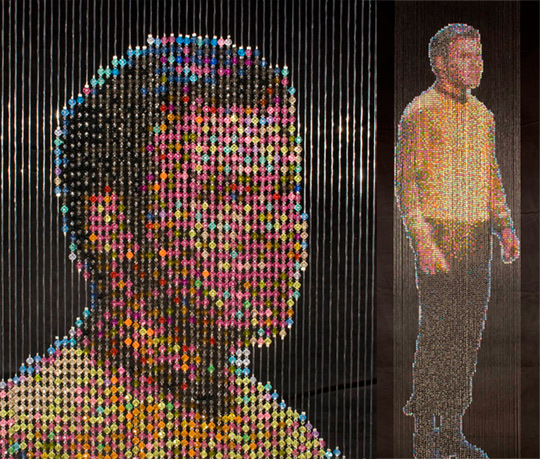 While Avinash Arora was capturing Star Wars stills in order to make his 6-foot-long photomosaic of Luke's Last Supper, Devorah Sperber spooled together an exhibit of similar artwork devoted to Star Trek. Mirror Universe, Sperber's show that opens March 20 at Caren Golden Fine Art in New York, consists of crafty Trek imagery pieced together out of beads and spools of thread. The show's title is an allusion to the 1967 Trek episode "Mirror, Mirror," in which the Enterprise crew is swapped with evil doppelgängers, but it also refers to the way viewers are supposed to look at the exhibit's art -- via reflective materials. "The concept and title for this exhibition gelled when I realized every Star Trek series had at least one episode based on the concept of a mirror or parallel universe, which fit in with my ongoing interest in the link between art and science, human perception and subjective reality," Sperber says. "The beaded figures are the most time-consuming works I have done to date," Sperber reveals. "In addition to laying out the beads in the correct order and stringing them onto monofilament, aligning the beads and attaching them to a hanging apparatus took weeks and weeks for each figure." Sperber also re-created Trek scenes using chenille stems, creating a needlepointlike pixelated snapshot from the show. What inspired Sperber to tackle the Trek project? "Although I am not a Trekkie, I have a vague recollection of watching reruns of the original Star Trek series in the 1970s with my father," says Sperber. "I also watched Star Trek: The Next Generation for a while in the late 1980s, but I was never a fanatic until 2002, when for a few months, I began scheduling my days so I could watch reruns ... every afternoon on Spike TV. I remember wondering why I was so intrigued. "Eventually, I realized the series offered an escape from the tumultuous post-9/11 world by presenting a utopian perspective of humanity at its best," she explains. "The mission of the TNG Enterprise was exploration and, with the exception of the Borg (you may recall their defining motto was 'resistance is futile'), the crew's confrontations with alien life forms were mostly based on misunderstandings and cultural differences vs. battles between good and evil." Sperber's exhibit runs through April 26 at the Caren Golden Fine Art gallery in New York.